I came to bed one evening with this at my bedside table. 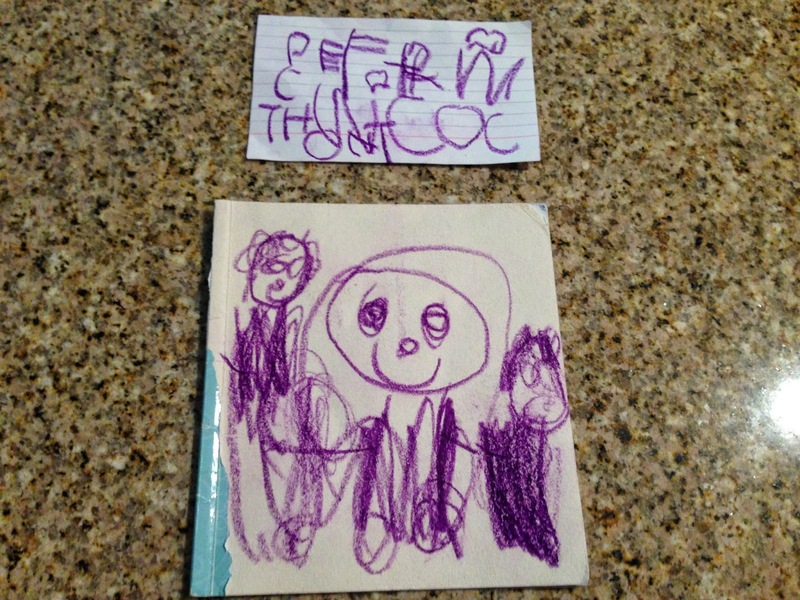 A note that I’m sure says something sweet and a picture of me with a smile holding Lily and Scott in my arms. What makes it even more meaningful is that Lily drew the picture on her favorite book (the cover is torn off). Lily was having a hard time going to sleep on this particular night, which usually results in discipline, crying, and screaming. Never fun. This night was no different. But while she was sobbing on her bed, she drew this picture for me then sneaked into my room to put it beside the bed. After such a hard night with her, seeing this picture before I shut my eyes was just the grace I needed to sleep peacefully. To know that in the midst of her disobedience, she was thinking of me. Not in a my mom is so mean to me kind of way, but in a I love my mommy and she loves us kind of way. I have my moments. Don’t we all? And my moments come more frequently specifically when there is a teething baby in the house that won’t stop fussing and wants to constantly be held and there is a little girl who just needs to get out of the house and do something but it’s been raining for 128,947 days. I worry a lot that at the end of the day Lily only remembers my attitude, my sighs of frustration, my impatience, my tone, my selfishness. After all, it’s all I remember about myself at the end of the day. All the ways I messed up and the things I could have done better. But after seeing this picture beside my bed, I realized that at the end of the day in the middle of her punishment, she’s not thinking about my sinful ways, she’s thinking about my God’s loving ways. If I can use the picture as evidence, she thinks of me as a mom who just loves her kids and loves being with them. And at the end of my day, there’s nothing more true than that. I love my family and I love being with them. The next morning when Lily walked down the stairs for breakfast, I got down on my knees, looked her in the eye, and told her how thankful I was for that picture and how much it meant to me and how it made me tear up and how sorry I was for being impatient and getting frustrated…and so on. Well that’s a very nice picture you drew for her Lily and I guess if I could read your nonsense words I would have known this was for Mrs. Connie and all of my irrational mommy pondering could have been avoided. At the end of the day, in the middle of her madness, Lily just loves Mrs. Connie!